The daisy flower can be found in all but a few ancient cultures. There are stories and historical information that indicate that some of the most powerful rulers of the ancient kingdoms had vast gardens of daisy and other flowers. In the early years, Daisy gardens were a symbol of class and prestige, and so any prominent person in the society had to have a garden of daisies. Although it can be found in most cultures, the daisy flowers seem to have a special place in the Roman Empire. According to one Roman Mythology Nymph, one of the most popular deities in Roman culture was dancing in a vast orchard but the orchard god kept a keen eye on her and hence restricted her movement. To escape from the orchard god she changed herself into a daisy flower and this is why the flower became so famous. There has also been an age-old relationship between the daisy flower and Christian. Christians see it as a symbol of purity and innocence, and so this explains why it became common for Christian faithful to get a daisy flower tattoo. Just like daisies come in different colors so do they have different meanings. The meaning of any daisy tattoo will depend on the type of daisy you have, its color and why you decided to get one. However, there are some common or widespread meanings associated with this kind of tattoos. Daisy tattoos are a sign of purity and innocence especially for Christians. Some Christians use this symbol to represent the purity and innocence of Jesus Christ and his mother the Virgin Mary. Some ladies also get this tattoo to symbolize that there are still virgins, and so they are still pure. Daisies can also be a sign of femininity and beauty. A flower is a beautiful image, and so some people believe that having one tattooed on them will enhance their beauty and general appearance. The daisy flower is associated with femininity in many cultures, and so one can get their tattoo to symbolize their femininity besides from enhancing their beauty. As a lady who wants to get in touch with their feminine side or a man who intends to show that he adores feminism, this tattoo would be a great idea. These tattoos can also be used as a symbol of faith. If you decide to get a religious tattoo like the praying hands or a tattoo of Jesus you can a daisy flower or a few of them on the tattoo to help you pass on the meaning intended. What makes them an excellent addition to religious tattoo is because they also symbolize peace, vanity, love and gentleness. This tattoo can also be drawn alone to express religious devotion, but it might be necessary to have a few words below or above the tattoo to explain the message that the tattoo symbolizes. The daisy tattoo is one of the few tattoos that will look fabulous no matter where you place it. The Daisy is exquisite, and as long as it is drawn correctly by a skilled tattoo artist you have the freedom to put it anywhere. The thigh is one of the most popular places for placing tattoos especially if you want to limit the people who see it and when they can see. Daisies will look fantastic when put on the thigh especially if it is a big and colorful one. The back provides an artist with enough room to work on your tattoo, and so this increases your chances of getting a great looking tattoo. However, you still need to choose where you place it on your back. Daisies look better when placed on one side of the back for example on the left side just behind the shoulder. If you are looking for a unique place to put your daisy tattoo then you can place in on the side of your body at the corner of the rib cage and below your arm. This is one place that very few people think of putting tattoos, and so you can be sure that yours will be unique. If you want a good place for your small daisy tattoo then you should think of the wrist. The wrist makes it possible for smaller tattoos to remain visible. By having your tattoo on your wrist, you will also get to see it anytime you want with little effort. 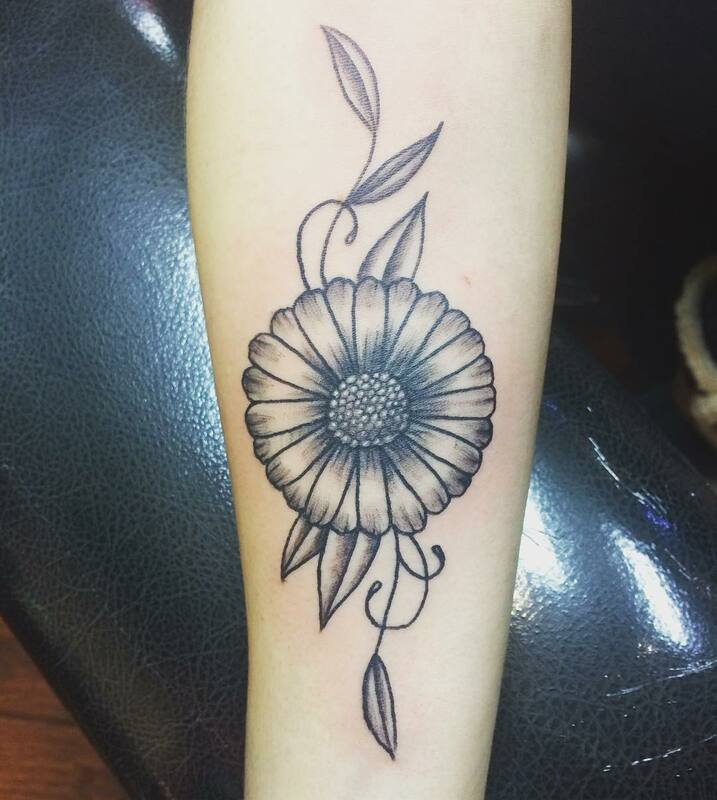 This tattoo is made up of a single daisy tattoo wrapped around the ankle with what looks like a flower stem. Although this type of tattoo is mostly drawn on the feet, some people have then around the wrist, and it still looks incredible. This is the most common type of this tattoo, and it comes in different variations and colors. In this sort of tattoo you can draw single daisy flower anyhow you like, and so its appearance will mainly depend on your artist and preferences. Daisies come in different colors, and this tattoo shows this. In this type of a tattoo, a single flower or a flower bunch are drawn with many colors. If it is a single flower different parts of it are given different colors and for a flower bunch each flower can take its own color. The secret behind an attractive multicolored tattoo is careful selection of the color combinations. It’s very odd to draw a flower with no colors, but the creativity of tattoo artists has no boundaries as evidenced in this type of tattoo. 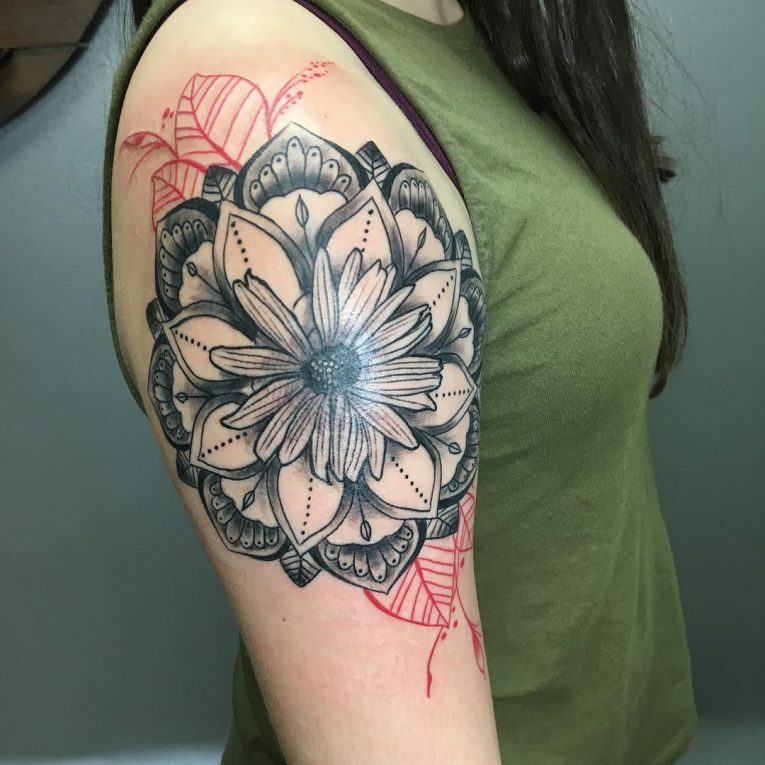 In this tattoo, everything is black and white as the flowers or flower is given no color at all. Contrary to what one might think this type of tattoo does not look dull at al especially if an experienced artist draws it. 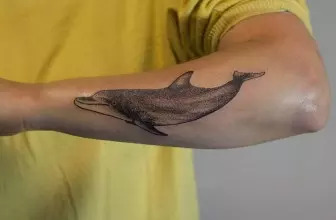 The only difference between this tattoo and others is the fact that a couple of words or a sentence is added to the tattoo. The wording is meant to give meaning to the symbol and to make it look more attractive.